After hundreds of entries and help from a panel of acclaimed judges from the design world, ten up-and-coming interior designers were chosen for the 2016 Traditional Home Magazine’s New Trads award. AKDO sponsored the award, and as part of that, offered each New Trad the opportunity to design their own custom mosaic. As first time program sponsors, we wanted to challenge the NewTrads class to produce designs the AKDO way, meaning that there be no restriction other than their imagination. So, we teamed up with the talented designers to create custom mosaic works of art. This exciting project marked the first time in the history of the program that these rising stars were commissioned by a sponsor to design bespoke products. After being given unlimited access to a variety of techniques and materials, the group was tasked with constructing an original mosaic measuring 3 x 4 feet, the designers each drew their inspiration from different sources; some from fashion, some from art, and some from personal relationships. The results are breathtaking, and very personal creations that certainly make an impact wherever they’re installed. Custom mosaic by Alyssa Kapito & Vivian Muller. Hand cut and hand-placed stone 3/8 x 3/8 tesserae. For this particular mosaic, NewTrad Alyssa Kapito & Vivian Muller were inspired by a mosaic from the Barnes Museum, an African Arts Museum in Philadelphia. The duo isolated a portion of a larger mosaic piece and transformed it into a repeating pattern. The piece does a beautiful job of portraying its ethnic influence, while the “the repetition of the shapes and lines and geometric aspect of the design” gives it a more modern appeal that makes it suitable for a variety of applications. Custom mosaic by Allison Dehn Bloom. Uses a mix of 3/8 x 3/8 and 1/8 x 1/8 tesserae. 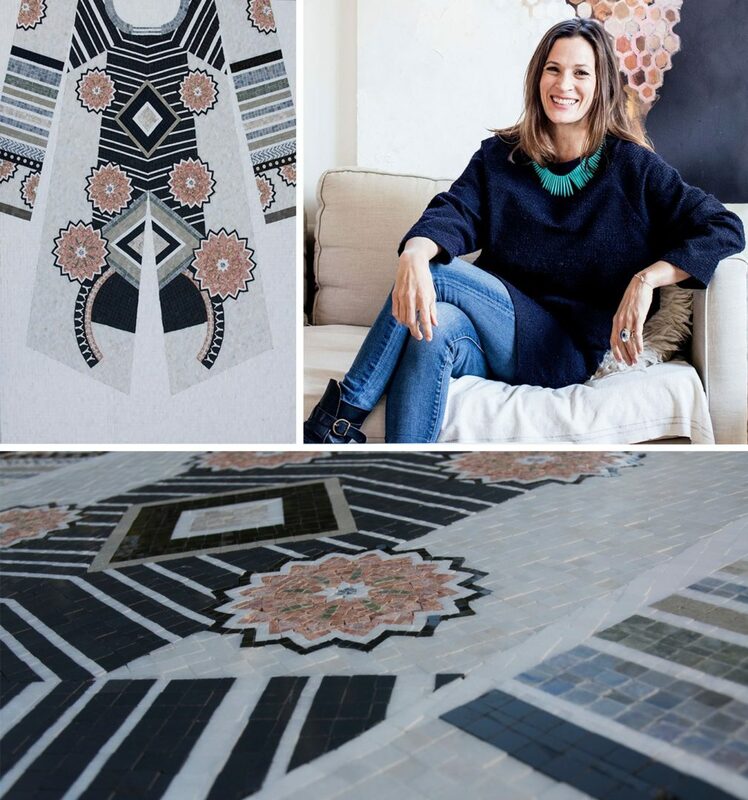 Allison Dehn Bloom took her custom mosaic inspiration from the works of one of her favorite fashion designers. The blend of “hippy, bohemian, and nomadic influences” harkens the pieces of designer Alix of Bohemia. The mosaic is a mix of 3/8 x 3/8 and micro 1/8 x 1/8 tesserae, which lends beautifully intricate detail to the floral motifs. Custom mosaic by Ashley Waddell & Courtney Whatley. 3/8 x 3/8 and 1/8×3/8 hand-cut and hand-placed mosaic tesserae. 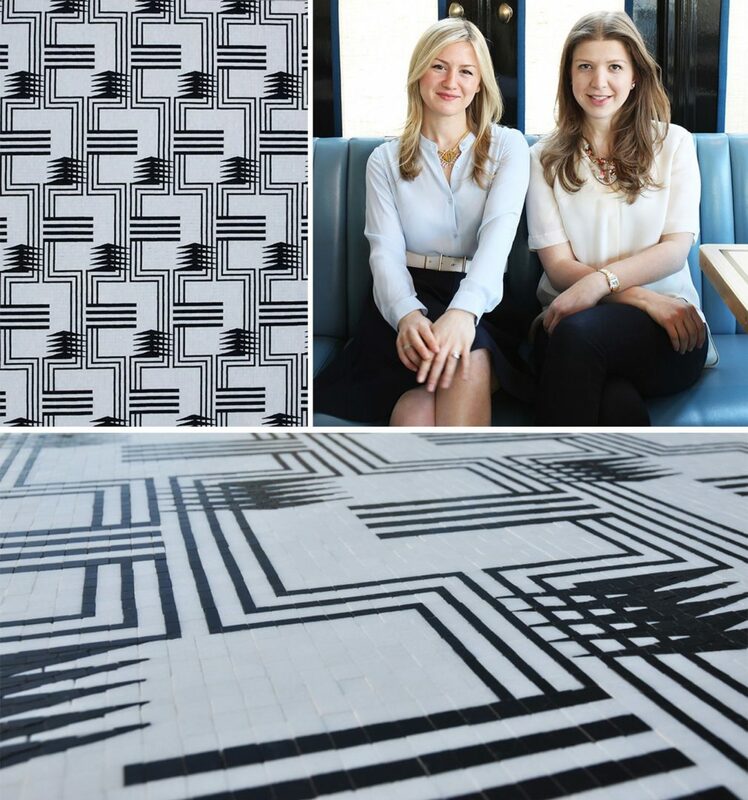 For this very graphic mosaic, Ashley Waddell and Courtney Whatley drew inspiration from “their lives as sisters and business partners.” The dynamic repeating pattern is a play on the pair’s daily life experiences, and represents how much they rely on one another in all aspects of their lives. We also love how Ashley and Courtney used an art deco color palette for a timeless appeal. Custom mosaic by Kevin Walsh. This one is 3/8 x 3/8 and 1/8 x 3/8 mosaic tesserae, hand cut and hand placed. 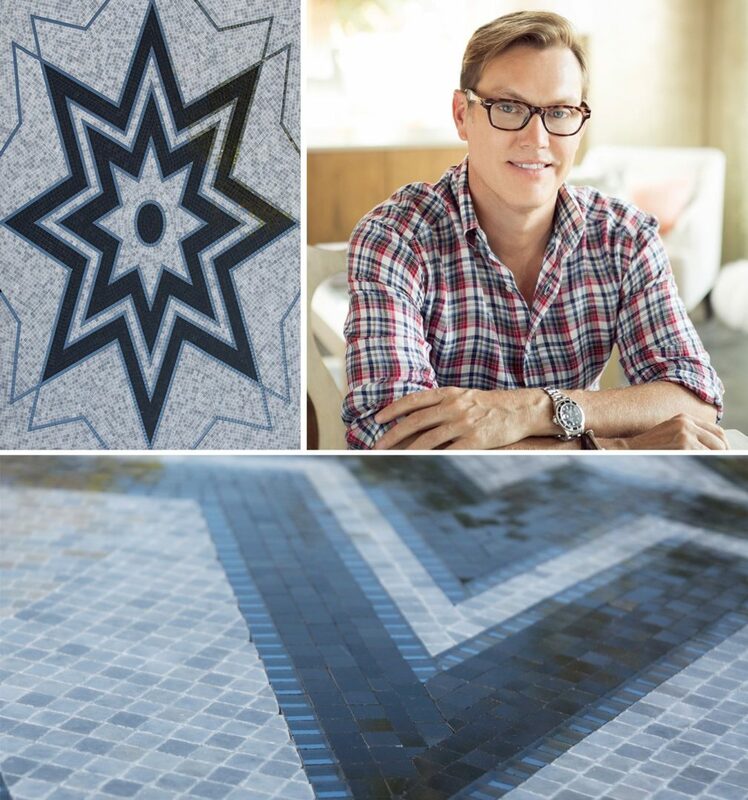 For his custom mosaic, Kevin Walsh was inspired by a 4”x4” vintage tile. 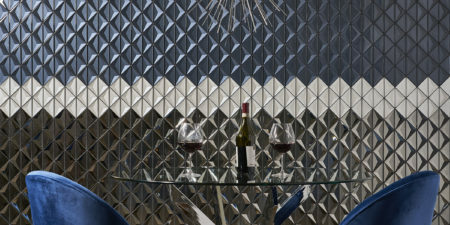 He up-scaled the pattern, with the intent that the large-scale design would infuse the shapes with a more modern feel. Additionally, he changed the mauve colorway to a sophisticated gray and black theme. Adding an accent line of pewter mirror makes this piece both unique and eye-catching. 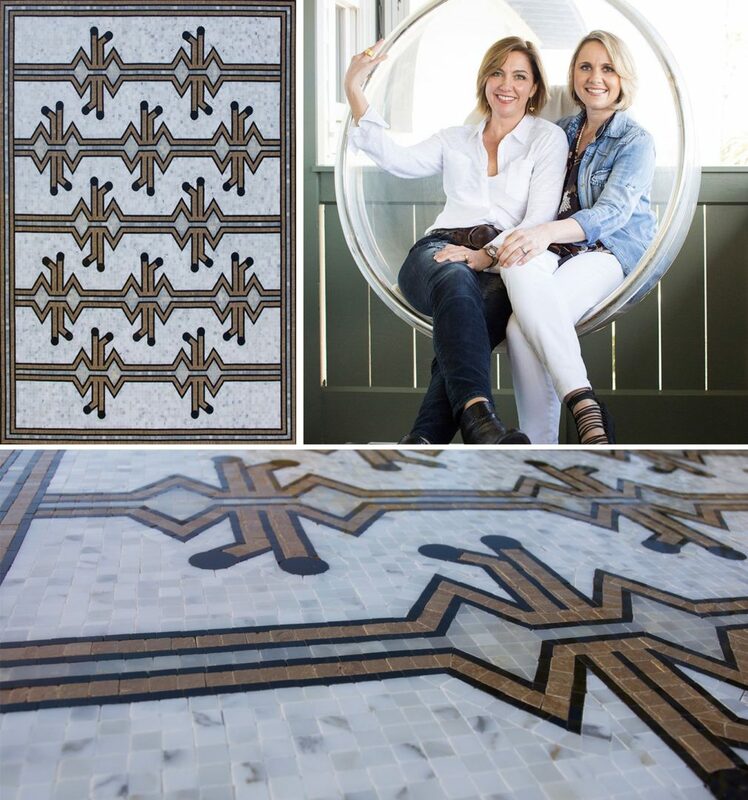 Custom mosaic by Krista Nye Nicholas & Tami Ramsay. 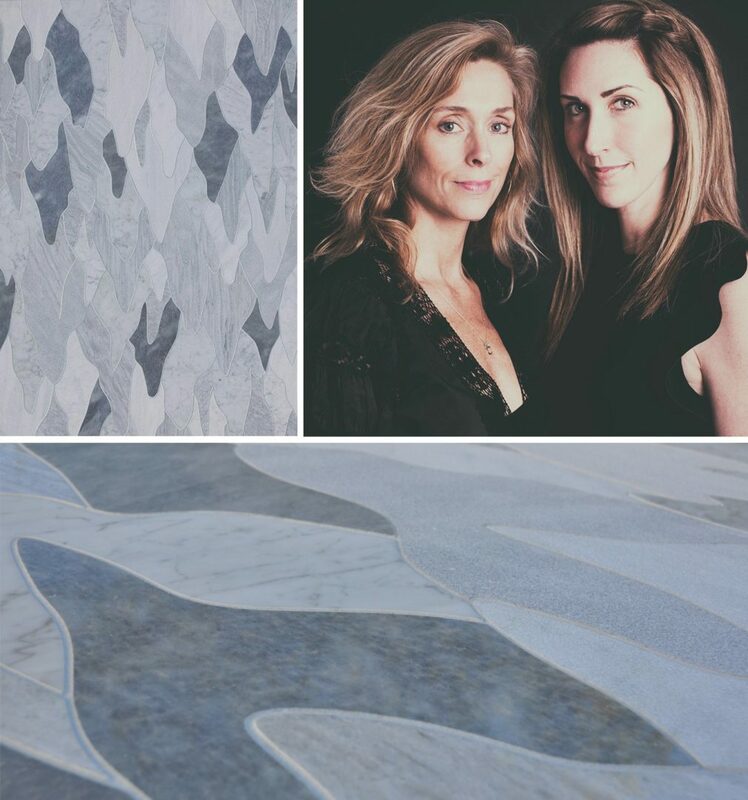 Krista Nye Nicholas and Tami Ramsay were inspired by nature when designing their mosaic. 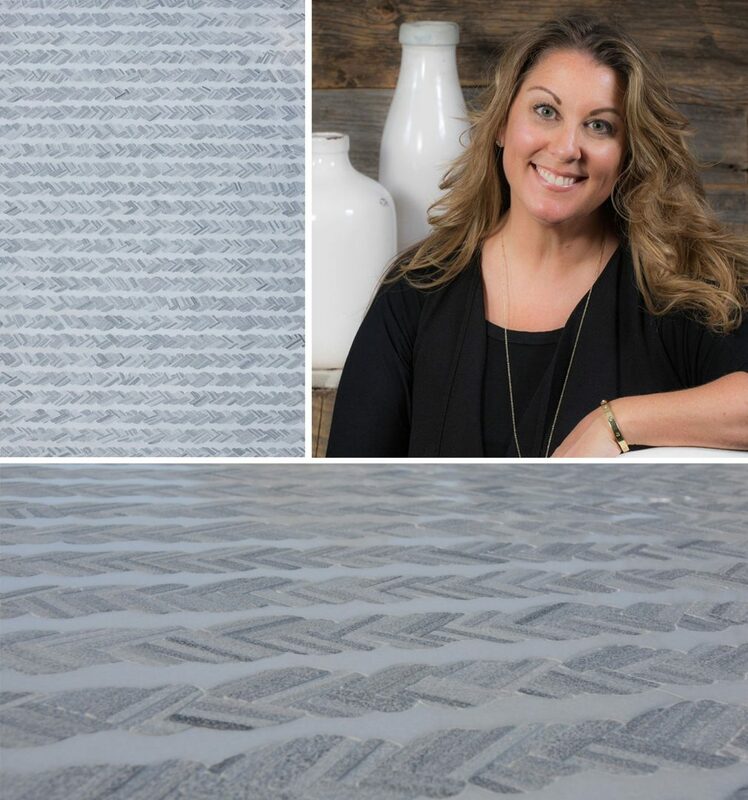 The design duo wanted to infuse an organic essence into their tile design, which lead them to produce a pattern similar to the texture formed in sand from lapping waves. The piece was done using water jet, and each of the peaks consists of different stones and textures, which include honed, polished, and sandblasted. We think the result is equally as calming as a day spent on the beach. Custom mosaic by Kristine Irving. Jigsaw-cut and hand-placed 3/8 x 3/8 tile. In this design, Kristine Irving stayed true to her aesthetic of modern meets traditional. Inspired by the boating community she moved to after falling in love with her now-husband, she decided to use nautical knots as the focus for her design. The shape represents her affection toward the sea, but is also a universal symbol for love. 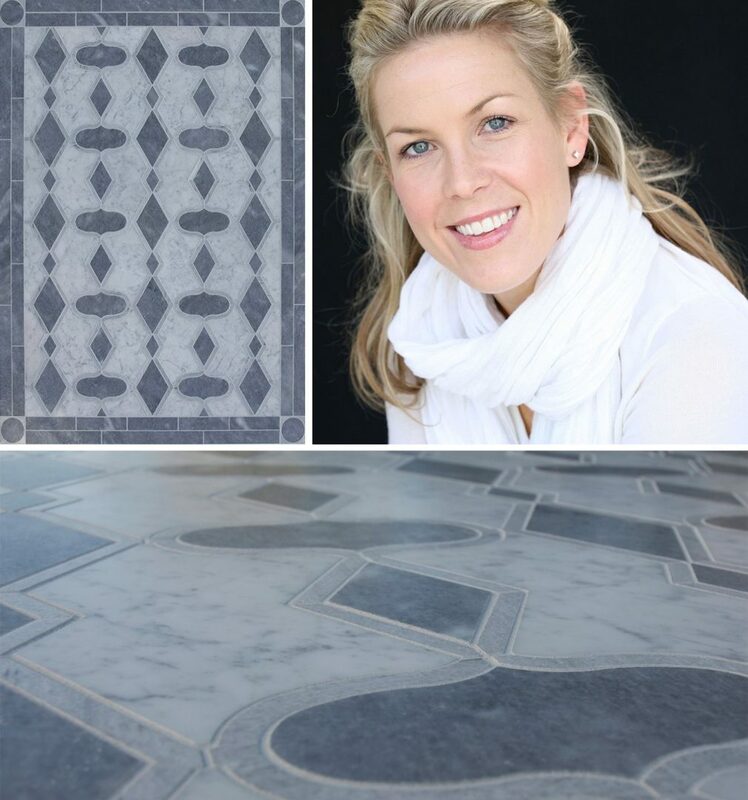 The pattern’s linear placement also gives this timeless design a graphic look. Custom mosaic by Robin Henry. 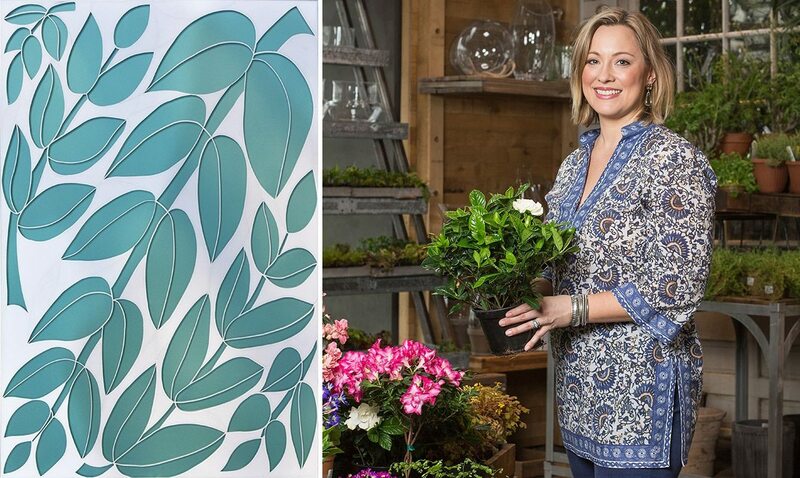 For this colorful mosaic, NewTrad Robin Henry designed a pattern “inspired by the simple botanicals of Ellsworth Kelly’s plant drawing and Matisse cut-outs.” The mix of waterjet glass and stone stone allows for sparkling depth, while the green glass gives the design an eye-catching pop of color. Custom mosaic by Meredith Ellis. When creating this beautifully tonal water jet piece, Meredith Ellis was inspired by her time living in Spain and Italy. The old-world design has “a sense of European style with a Moorish influence” that was the result of using alternating geometric shapes from centuries-old church floors. The designer imagines a larger version of this would be a striking focal point in a foyer. Custom mosaic by Liz Stiving-Nichols. 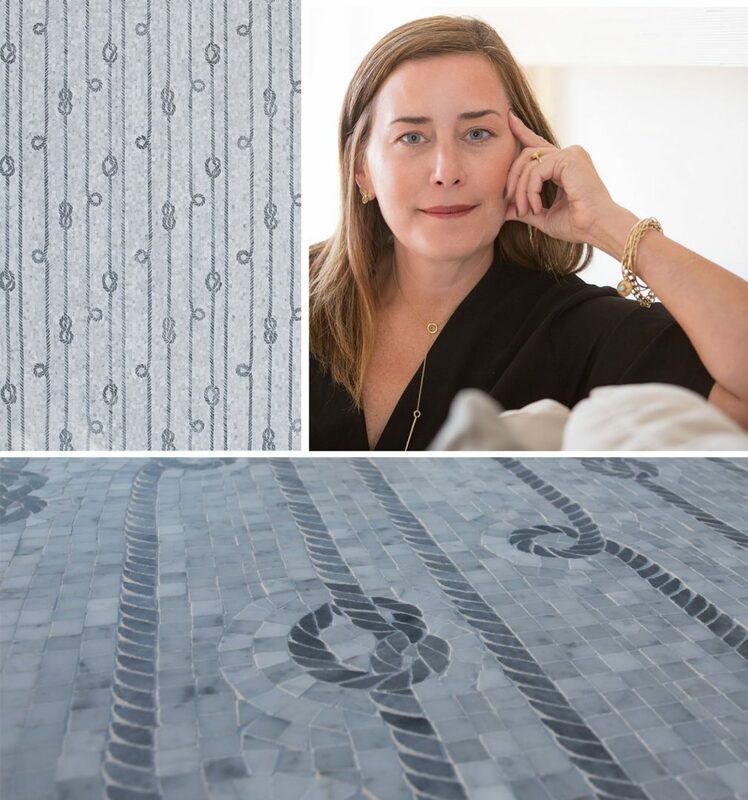 The island of Martha’s Vineyard provided plenty of inspiration for Liz Stiving-Nichols when it came to designing this mosaic. Liz used a nautical rope pattern as the focus for this piece, favoring its “balance of rough texture and refinement.” The mosaic utilizes 1/8” matchsticks of zebra stone with a beautiful natural striation to evoke the fibrous look of rope, while the sandblasted finish gives the piece a weathered feel.